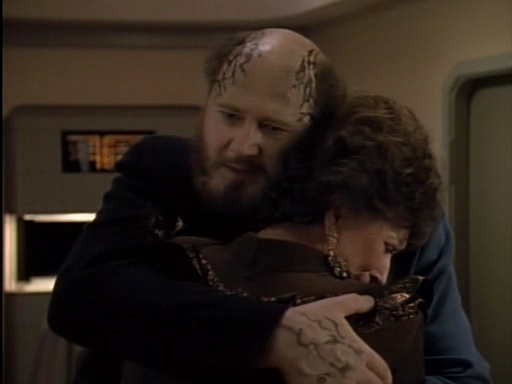 While being a lower than usual quality episode in terms of action and having WAY too much Lwaxana (who is deadly annoying); this episode left me with something to think about for the last few decades and probably has even changed who I am a little. The episode centers around a guy named Dr. Timicin who comes on board the Enterprise to do some science experiments with the big fancy ship; not much else there. What they do find out is that Dr. Timicin has only a few days left to live because he’s turning 60 and that’s the end of the line in their culture. I don’t recommend assisted suicide or euthanasia at all but it did help me think through that dying earlier than we expect isn’t such a bad thing. I mean, if we really believe that heaven’s as great as we make it sound to be, shouldn’t we be rushing to get there?!? Hungry for some chips? No worries, death at 60 – don’t want to go too much past that. Sidebar: does that guy look like Lyf’s Dad, Eric, or what? !